The street food business in the Philippines has carved a niche of its own. Informal, unpretentious, and affordable, the traditional Pinoy street foods cater to growling stomachs who don’t have the time and money to go to fine-dining restaurants. Some even make them part of their daily diets just for the thrill of it. If you want to sell something that appeals both to the taste and budget of the masses, you can never go wrong with a street food business in the Philippines. This guide will show you how to start it from the ground up. Budding entrepreneurs and food enthusiasts whose starting capital are too small for a carinderia or catering businesses. Those living in populated areas near schools, offices, terminals, or busy streets. It doesn’t need large capital. No need to pay rental fees if you’re going to start the street food business in front of your house. Lower overhead cost compared to other food businesses. Minimal promotion/marketing since people are already familiar with the street foods. All you need is to leave a good first impression to have repeat customers/buyers. Location isn’t a problem since you can sell it almost anywhere with high foot traffic. If it’s not possible to launch it in your own place, a mobile food cart allows you to sell it anywhere else. Affordable prices mean more potential customers and more flexible profit margins. The market is diversified. Street foods appeal to the taste buds of Filipinos from all social classes, assuming that your products have great flavors that people can’t get enough of. As with any other type of food business, street foods take a lot of time and effort to prepare. Depending on the type of street foods, it’s not unusual for vendors to wake up as early as 4 A.M. every day to buy fresh ingredients and spend the remaining hours preparing sauces and putting the foods on a skewer. It takes time to scale it into a multi-million business. Unless you’re already an established name that is ready for franchising, you have to spend years developing your product and building your customer base. Since the street food business in the Philippines has low start-up cost, expect high competition. To stand out, you need to think of innovative ways to attract more customers. How to start a street food business in the Philippines. Step 1: Decide whether to franchise or go independent. The easier path, of course, is to franchise an already established brand. One advantage is sanitation. Since traditional street food vendors in the Philippines are notorious for their unsanitary practices, several food cart companies offer their products in great packaging and promote them as safe, clean, and fresh. 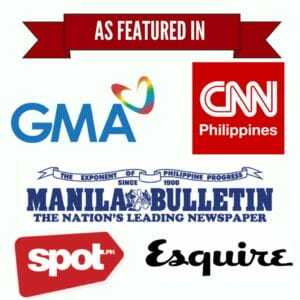 Food cart companies like Pinoy Hot Balls and Fries, Takoyaki, and Gulaman Corner also offer assistance in marketing and finding a good location for your stall. Of course, none of these food carts have the same charm as legit street foods peddled in actual streets. People flock to them because they provide a homey vibe you won’t get in air-conditioned malls. In addition to that, starting your own street food business from scratch requires less capital. You have control over what street foods to offer and how many to sell without being burdened by any franchise fee. Step 2: Pick a strategic location. A location where there’s high volume of people is non-negotiable if you want your street food business in the Philippines to profit. It doesn’t matter how tasty or flavorful your street foods are; if your location is too far from your target market, nobody will bother to buy from you. Remember, businesses should find and come to their potential customers, not the other way around. Strategic locations may include areas near schools, terminals, offices, or busy roads. If that location happens to be where your house is also located, good for you. You will recover your initial investment faster since you don’t have to pay rent. Step 3: Choose the type of street foods you’re going to sell. Thanks to Filipinos’ creativity and penchant for turning ordinary stuff into delectable street foods, you’ll never run out of choices to offer. The best part is you don’t have to spend much in terms of packaging since most street foods are placed in plastic cups/bags, poured in a bowl, or put onto skewers. Isaw – intestines of either chicken or pig that are coiled onto skewers and grilled over charcoal. It’s smoky flavor contrasted with the sweet and tangy vinegar sauce make it a perfect afternoon snack or pre-dinner appetizer. Ukoy – a classic Filipino fritter made of bean sprouts, shrimps, and julienned squash mixed with orange batter and deep-fried to crispy perfection. Ideally partnered with a sweet vinegar sauce. Kwek kwek – quail eggs covered in orange colored batter and deep fried. Other variations include hot dogs covered in the same orange batter (think Filipino version of the popular corndogs). When dipped in vinegar sauce with chopped garlic, onion, and chilis, kwek kwek bursts with amazing flavors that Filipinos are all familiar with. Helmet, Adidas, and Betamax – grilled street foods made of chicken head, chiken feet, and coagulated chicken blood, respectively. 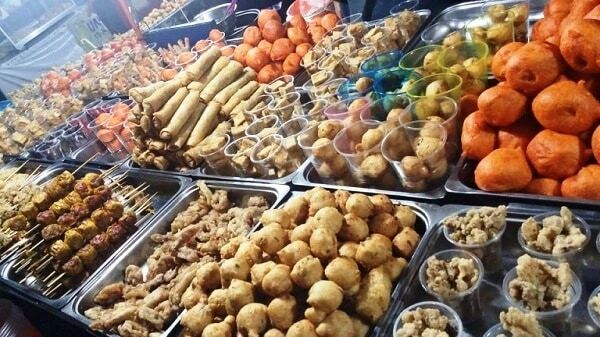 Although some foreigners may find them repulsive, these adventurous street foods are prime examples of Filipinos’ resourcefulness. As they always say, one man’s trash is another man’s culinary treasure. Mango-on-stick – Fresh, green Indian mangoes with seeds removed and poked onto skewers then served with a nice spread of sweet, salty shrimp paste (bagoong). It’s the ultimate summer snack that passersby won’t be able to resist. Fish balls/chicken balls/squid balls – the all-time favorite Filipino street food snack, fish balls are usually served by getting your own skewer and poking them straight out of the oil. Although the balls are made primarily of flour, the sweet and special “Manong’s sauce” is the reason why people keep coming back for more. Other street food ideas: Balut, Banana Q, turon, binatog, 1-day-old fried chicken, taho, mami, sotanghon, and palabok. Step 4: Find a reliable supplier. Owning a street food business in the Philippines requires you to shop for fresh ingredients every day. Hence, it’s important to build a long-term partnership with a reliable supplier in the market, one who will set aside quality and fresh materials for you and give discounts when you buy in bulk. In turn, don’t let this relationship go sour by not paying on time. Remember, your business heavily depends on your suppliers. Without enough raw materials, your daily business operations will be affected. Step 5: Invest in the right equipment and people. You can start a street food business in the Philippines with whatever you have. Use grilling/cooking equipment and utensils you already have and save money in the process. In case you need to buy new items, don’t sacrifice quality for affordability. Most cheap products don’t last long and the money you save by buying them could have been better spent on pricier but more durable alternatives. When starting out, you also need at least one person to assist you in operating the business. Find someone trustworthy who will never resort to pilfering. Don’t just rely on referrals. Check the person’s background meticulously. Set up an easy system to track daily inventory activities so you’ll know how much money comes and goes and prevent profit loss due to stealing. Step 6: Make a delicious sauce. Street foods won’t be as appetizing without their corresponding sauces. In the Philippines, sauces are just as varied as the streets foods they complement. It reflects the different preferences and tastes of Filipinos–some like it spicy while others prefer sweet with a little bit of tanginess. Sauces are so important that customers buy streets foods for the sauces alone. They pour it on their rice like a soup and eat it as if it’s a full-course meal. So, if you want to earn a lot of suki, work on your sauces and perfect it like a real chef would. Luckily, YouTube is a treasure trove of tutorials that will teach you how to make the special vinegar sauce or the popular “Manong’s sauce” perfect for fish balls. Step 7: Set the right price for your products. Right pricing can be the difference between a successful street food business and one that is a dud. You want to price your street foods to cover your overhead cost while keeping them affordable. Survey your competitors to gauge whether you’re pricing your products too low or you’re going overboard. Always remember that the reason why Filipinos prefer streets foods is that they fill their stomachs without hurting their pockets. Keep the prices “abot-kaya” for the masses but never forget that this is a business and businesses need to profit. Step 8: Observe proper sanitation. Street food vendors, especially the ambulant ones, have earned the bad reputation of putting their customers’ health at risk due to their unsanitary practices. Don’t be one of them. Instead, break the stereotype by keeping your area clean and observing strict sanitation during food preparation and storage. The last thing you want is your business to crumble in pieces due to a customer contracting diseases from the food you serve.